British Airways is making a multi-million pound investment in its short haul business class cabin, Club Europe. The spend is part of the airline’s current £4.5bn investment plan and will focus on enhanced food and drink. 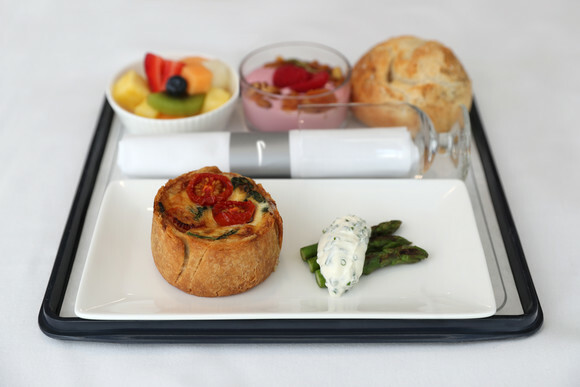 From September 12* the airline will introduce new menus with improved recipes and signature warm breads. There’s also a commitment to provenance, with dishes developed around key British ingredients. Launch options will include shaved Herefordshire roast beef on a tartar cream with rocket, British Reared Pork sausage and mash and a celebration of British cheeses. On the airline’s longer short haul flights to destinations such as Faro, customers will now have the choice of two hot options and one cold. Menus on flights to and from Heathrow will also be changed twice a month, rather than monthly. As well as enhanced food, the airline will also be refining the beverages on offer, with new wines served in quarter bottles and coffee provided by British speciality roaster, Union Hand-Roasted coffee. Short haul economy customers will also see the new Autumn M&S On Board menu launch. New items include one of the retailer’s top food-on-the go sellers – the chicken and bacon sandwich. A new vegetarian café sandwich selection called ‘Life On The Veg’ will also be making its debut. Lounges are also benefitting from the investment and the airline has already unveiled new lounges in Rome and Aberdeen, showcasing the airlines new design concept. The airline will be opening a new lounge in New York later year, followed by Geneva, San Francisco, Johannesburg, Chicago and Heathrow’s lounges will benefit from a refresh. British Airways’ £4.5 billion investment for customers over the next five years, also includes the installation of the best quality WiFi and power in every seat, fitting 128 long-haul aircraft with new interiors and taking delivery of 72 new aircraft.